If you’re afraid of water, you’re not alone! More than half of all adults report real discomfort about being in the deep end of a pool with nothing to hang on to. You might think that if you're uncomfortable in shallow or deep water, learning the freestyle will take care of it. We know, though, that attempts to learn freestyle without first being comfortable in the water takes a very long time and isn’t the fun and enjoyable experience it should be. So what’s the answer? 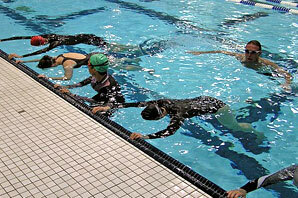 There IS a proven method for overcoming fear of water, and our instructors are certified in it. It’s the nationally known Miracle Swimming Institute method for conquering fear of water. And it absolutely works! The Overcoming Your Fear of Water class will give you new skills and understanding of how the water works, with the end goal of comfort and safety in any depth of water. The key is always staying in control and going at your own pace. After you are comfortable using basic skills in deep water, you may want to learn how to swim laps, gain stamina, learn how to dive and just have more fun in the swimming pool. When you are ready we offer Beginning Freestyle or Breaststroke classes to help you achieve your swimming and fitness goals. Not sure if you are a Fear of Water candidate? Take the Swimming Quiz to find out. And if you’d like to try us out before signing up for the 12-hour* class, remember to try our Introductory Swim Class, to begin the journey of swimming safely and comfortably, with confidence and ease. Our class was featured on CBS Channel 11 news, "Get Healthy Texas." It's called "North Texans Getting Healthier Conquering Fear." Click here to watch. "The class that you teach is truly remarkable. The concept works. This was one class that I absolutely hated to see come to an end. The concept of conquering the fear of water seems so obvious yet I have never heard of anyone else who teaches it. You are correct that once the fear is gone, you can concentrate on beginning to learn to swim. The first two days, I sat in your class incredibly nervous. Yet, your patient, calm and personable way of teaching soon would change my nervousness and apprehension into the most enjoyable and successful swim class that I have ever experienced. Your calmness is so contagious and makes a world of difference. John was also an incredible instructor, his sense of humor broke a lot of tense moments in the classroom as well as at pool side. Both of you complement each other and make such a successful team. Once again, thank you. I feel so privileged that I came across your website and found your swimming instruction classes. I will highly recommend you." Later that afternoon, my wife and I went to a party at an acquaintance's house to celebrate the graduation from high school of their two daughters. I had never been in their backyard. As I walked out to the backyard, I saw their pool. In the past I would have approached a pool and checked for steps, where the shallow part ends and the dreaded deep begins, and the location of ladders. I would also have experienced a certain amount of tenseness as I approached the pool and thought about it. "When you take a class from an Olympian, you figure the name is a marketing ploy. But I can speak for this class; they know what they're doing." After taking our beginning swimming classes you will be on your way towards a lifetime of water fun. Because each person's past experience with the water is unique, so is their learning time. Overcoming fear of water cannot be rushed and most people take a minimum of 2 classes to begin swimming in the deep water. 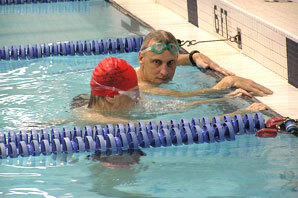 Once you feel comfortable and safe in the deep end, we can help you learn how to swim laps for fun and fitness. What you’ll need to bring: just a swimsuit, goggles, towel and your photo ID. Lockers are provided.